According to the Ottawa Citizen, residents of the city are, in general, in favour of the fourth option brought forward to City Council for Ottawa's transit improvements. Transit planners said in a report that "thousands" of people provided their comments on the future of transit in Ottawa in meetings, online, in street interviews and in other ways. The results, they say, show "broad support for Option 4." That option includes a downtown tunnel and light-rail system running east and west to the edges of the Greenbelt and south past the airport. Under the option, which would cost about $4 billion and be built as funds become available, improved suburban bus transitways would feed into the rail lines. The fourth option is, by far, the most comprehensive of them--and its estimated cost of $3.82B reflects that (although it is not the most expensive, Option Two is projected at $3.87B). 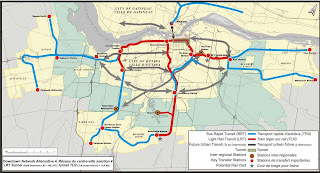 The plan would include both a North-South and an East-West rail line, as well as an underground tunnel downtown. The illustration below, taken from the presentation given to the City Council, shows the plans (click on the picture to enlarge).